Analysis: Jones missed two games due to a similar injury to his right knee last season, so he may be in danger of missing the rest of the campaign with as many contests left on the Packers' slate. The team should clarify his status in the coming days, but Jamaal Williams nonetheless is poised for an uptick in touches with Jones hobbled. Analysis: Jones left near the end of the first quarter with four carries for eight yards on the ledger. The severity of the knee injury is unknown, but Jamaal Williams is the only healthy and active running back on the roster at the moment. Jones is questionable to return to Sunday's game at Chicago due to a knee injury. Analysis: Jones entered the blue medical tent late in the first quarter to have his knee examined. If Jones is unable to return, Jamaal Williams will be the sole healthy running back available to the Packers offense. Jones had 17 carries for 78 yards and a touchdown while catching all three targets for 28 yards in Sunday's win over the Falcons. Jones rushed 11 times for 36 yards and a touchdown while catching all four of his targets for 16 yards in Sunday's 20-17 loss to the Cardinals. Analysis: Expectations were high for Jones coming in, as he entered with four rushing touchdowns in the previous three weeks and an average of 6.0 yards per carry this season. Surprisingly, a Cardinals defense that came in allowing 144.8 yards per game on the ground was able to hold Jones to a season-low 3.3 yards per carry. Still, Jones tied the game 17-17 on an 8-yard rushing score with 5:26 left, which should make owners feel good about turning right back to him against the Falcons in Week 14. Jones carried the ball 17 times for 72 yards and a touchdown, adding another 21 yards on three catches (five targets) in Sunday's 24-17 loss to the Vikings. Jones rushed 11 times for 40 yards and a touchdown and brought in five of six targets for 63 yards and another score in the Packers' 27-24 loss to the Seahawks on Thursday. Packers quarterback Aaron Rodgers said the team needs to continue giving Jones opportunities, Ryan Wood of the Green Bay Press-Gazette reports. Jones carried 15 times for 145 yards and two touchdowns Sunday against the Dolphins. He also caught three passes for 27 additional yards in the 31-12 win. Jones ran for 76 yards on 14 carries and brought in two of four targets for 10 receiving yards in Sunday's 31-17 loss to the Patriots. Jones amassed 86 rushing yards and a touchdown on 12 carries, adding two receptions for zero yards during Sunday's 29-27 loss to the Rams. 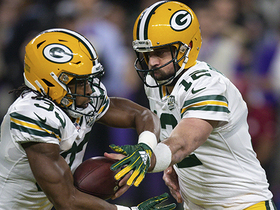 Jones rushed eight times for 41 yards Monday in the Packers' 33-30 win over the 49ers. Analysis: Jones drew the starting assignment over Jamaal Williams and barely missed out on a touchdown on Green Bay's first drive of the game. The shifty tailback still led the Packers in carries and rushing yards, continuing to make his claim for a larger workload. While he didn't catch any passes Monday, Jones' ability should warrant consideration for more activity when Green Bay reconvenes from its Week 7 bye. Jones had seven carries for 40 yards and two receptions for 19 yards in Sunday's loss to the Lions. Jones rushed 11 times for 65 yards and a touchdown while catching his lone target for 17 yards in Sunday's 22-0 home win over Buffalo. Jones (suspension) rushed six times for 42 yards and and brought in his only target for five yards in the Packers' 31-17 loss to the Redskins on Sunday. Analysis: Jones was supposed to lag behind both Jamaal Williams and Ty Montgomery in terms of workload in the backfield, but he ended up pacing all backs in rushing touches. While that equated to a modest six carries, Jones looked sharp with them on his way to a 7.0-yard average. With his first taste of game action in 2018 under his belt, he'll look to build up his overall numbers against the Bills in Week 4. 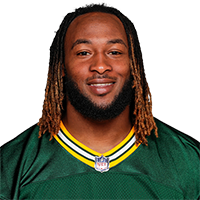 Head coach Mike McCarthy said Wednesday that Jamaal Williams and Ty Montgomery "will be in the first slot" among the Packers' running-back group, suggesting Jones may handle a limited role Week 3 against the Redskins, Rob Demovsky of ESPN.com reports. The NFL lifted Jones' suspension Monday, per the league's official transaction log. Analysis: Thus concludes Jones' two-game ban for a violation of the NFL's policy on substances of abuse. 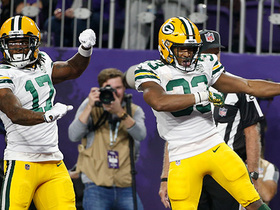 With Jamaal Wiliams serving as the primary option on the ground game during that time, the Packers ranked 25th in the category with 83.5 rushing yards per game. The team's modest 4.0 yards per carry is actually getting weighed down by Williams' dismal mark of 3.4. There's nowhere to go but up, and Jones can do just that after recording 5.5 YPC and two 100-yard efforts as a rookie last season. Jones (suspension) took nine carries for 34 yards and a touchdown and caught three of four targets for 21 yards in Thursday's preseason finale against the Chiefs. Jones (suspension) took five carries for 18 yards and didn't get any targets in Friday's preseason game against the Raiders. Jones (hamstring, suspension) handled first-team reps at Monday's practice, Michael Cohen of The Athletic Wisconsin reports. 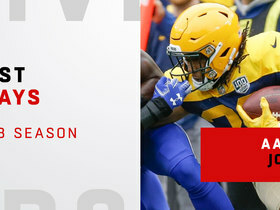 Analysis: Jones has been in recovery mode since the outset of training camp due to a hamstring injury, which has kept him out of both Packers exhibitions to date. Taking reps with the starters is a great sign that he's trending toward game action Friday in Oakland. The appearance likely would be his last until Week 3 of the regular season, which he'll kick off with a two-game suspension. During that time, Green Bay's backfield will be composed of Jamaal Williams (ankle) and Ty Montgomery. Coach Mike McCarthy is hopeful Jones (hamstring, suspension) will be ready for a little bit of playing time in Friday's preseason game against Oakland, Rob Demovsky of ESPN.com reports. Jones (hamstring, suspension) won't play in Thursday's game against Pittsburgh, Ryan Wood of the Green Bay Press-Gazette reports. Analysis: Jones warmed up before Thursday's game but he won't see the field at all as he recovers from a hamstring injury. Look for Jamal Williams and Ty Montgomery to handle the first and second-team reps with Jones out. Jones (hamstring, suspension) is suited up for Thursday's preseason contest against the Steelers, Tom Silverstein of the Milwaukee Journal Sentinel reports. Analysis: Jones didn't turn in a full practice in advance of this game due to a hamstring injury that his lingered from training camp into the preseason slate. As a result, he may merely go through pre-game warmups before residing on the sideline thereafter with the rest of the scratched players. If he doesn't suit up, the backfield will again be the domain of Jamaal Williams, Ty Montgomery, Joel Bouagnon and Akeem Judd. Jones (hamstring, suspension) was a limited practice participant Monday, Rob Demovsky of ESPN.com reports. Jones (hamstring) participated in practice Sunday, Tom Silverstein of the Milwaukee Journal Sentinel reports. Analysis: Absent from practice for more than two weeks due to a hamstring injury, Jones appears ready to reenter the battle for backfield touches. While he'll miss the first two games of the season due to a violation of the NFL's substance abuse policy, he'll be a part of a committee, at least, with Jamaal Williams and Ty Montgomery once Week 3 of the regular season rolls around. Jones (hamstring, suspension) isn't practicing Friday, Tom Silverstein of the Milwaukee Journal Sentinel reports. Analysis: Jones expected to return by Thursday but will instead miss a full week of practice. Already facing a two-game suspension to begin the season, Jones needs to get on the practice field to make his case for a role in the Green Bay backfield upon returning in Week 3. His absence has allowed Jamaal Williams and Ty Montgomery to dominate first-team reps in training camp, though Jones still has time to make some noise during the preseason. Jones (hamstring, suspension) expects to be back at practice by Thursday, Michael Cohen of The Athletic Wisconsin reports. Analysis: Jones confirmed his injury isn't serious, even saying he would be able to play in a game if the Packers had one Monday. He still has plenty of time to make his case for a role in what figures to be a committee backfield, after watching Jamaal Williams and Ty Montgomery handle most of the first-team work early in camp. Jones should be be busy during the preseason, but he'll start the regular season with a two-game suspension stemming from a violation of the NFL's substance abuse policy. Jones (hamstring, suspension) won't practice Monday, Tom Silverstein of the Milwaukee Journal Sentinel reports. Analysis: Packers coach Mike McCarthy declined to provide a timeline, simply stating that Jones will miss at least one more practice while recovering from a hamstring injury that was first reported Saturday. The second-year back is facing a two-game suspension to start the season, but he could have a key role beginning Week 3 if he makes a strong impression over the next month. Jamaal Williams and Ty Montgomery will duke it out for the Week 1 starting job. Jones (suspension) was absent from Saturday's practice due to a tight hamstring, Jason Wilde of ESPN.com reports. Jones was suspended two games Tuesday for a violation of the NFL's substance abuse policy, Mike Garafolo of NFL Network reports. Jones focused on adding muscle to his lower body during the offseason, Wes Hodkiewicz of Packers.com reports. "I'm bigger all around," Jones said. "That's something that's going to help me in pass protection and that's something I want to get better at." Jones (knee) was on the field for the first round for OTAs, Mike Spofford of Packers.com reports. Jones (knee) pleaded no contest Wednesday to one of the three charges from a traffic stop on Oct. 1, Jeff Bollier of USA Today reports. Jones (knee) has been ruled out for Sunday's game against the Lions. 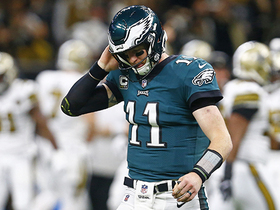 Analysis: The extent of the knee injury Jones suffered in Week 16 is still not entirely certain, but it has prevented him from practicing this week and will sideline him for the Packers' regular-season finale. Jones finishes his rookie season with a pedestrian 448 yards, but he will be a player to keep in mind heading into fantasy drafts in 2018. He averaged a healthy 5.5 yards per carry and proved capable of handling lead-back duties several times during the campaign. Packers head coach Mike McCarthy said that Jones (knee) wouldn't practice Wednesday and is likely to sit out Sunday's game against the Lions, Michael Cohen of the Milwaukee Journal Sentinel reports. Jones (knee) appears unlikely to play in the Packers' Week 17 game against the Lions, Rob Demovsky of ESPN.com reports. Jones injured the MCL in his left knee during Saturday's defeat to the Vikings, Rob Demovsky of ESPN.com reports. Analysis: During a media session Sunday, head coach Mike McCarthy touched on Jones' health, noting he suffered a similar knee injury to the MCL sprain from Week 10. Only this time, Jones' left knee is bothering him, instead of the right one. The previous issue forced a two-game absence, so Jones' rookie year seems to be in peril. Expect clarification on his status in the coming days, but Jamaal Williams is poised to be the unquestioned lead back if Jones is shut down for the season finale. Jones is slated for an MRI on the knee injury that forced him from Saturday's loss to the Vikings, Ian Rapoport of NFL Network reports. 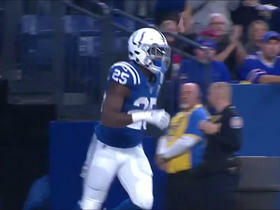 Analysis: Upon his removal in the second quarter, Jones yielded the entire backfield to fellow rookie Jamaal Williams. The upcoming examination likely will have a bearing on Jones' standing for Week 17. If caution reigns and he takes a seat, Devante Mays will act as Williams' sole backup in the season finale. Jones (knee) is out for the rest of Saturday's game against the Vikings. Analysis: With Jones out, fellow rookie Jamaal Williams will likely play a hefty majority of the snaps in Green Bay's backfield. Jones will finish the game with three carries for 13 yards. Jones is questionable to return to Saturday's game versus the Vikings due to a knee injury. Analysis: Jones' last touch before the announcement occurred on a six-yard run on the final play of the first quarter. If he's unable to reenter the contest, he'll finish with three carries for 13 yards. Expect Jamaal Williams to receive nearly all the running back reps in the meantime. Jones rushed three times for 47 yards and brought in one of two targets for six yards in Sunday's 31-24 loss to the Panthers. Jones lost two yards on four carries in Sunday's 27-21 overtime win in Cleveland. Jones (knee) rushed once for a 20-yard touchdown to seal Sunday's 26-20 overtime win against the Buccaneers. Analysis: Jones' game-winning 20-yard scoring scamper was his only touch of the afternoon in his return from a two-game absence due to the knee injury he'd suffered against the Bears in Week 10. 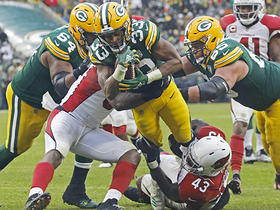 Jamaal Williams has done an increasingly impressive job as the Packers' bell-cow back over the last trio of contests, topping out with a career-high 113 rushing yards Sunday. Therefore, expect Jones to serve in a complementary role alongside his fellow rookie for the foreseeable future. Jones (knee) is active Sunday against the Buccaneers. Jones (knee) is expected to play Sunday against Tampa Bay, but Jamaal Williams is expected to still get most of the playing time, Adam Schefter of ESPN reports. Analysis: Jones was a limited practice participant all week, which, combined with this report, suggests he will be active. However, it's not clear how much he'll play and he will likely be a risky fantasy option give Williams' current status. Jones (knee) remained limited at Friday's practice and is listed as questionable for Sunday's game against Tampa Bay, Tom Silverstein of the Milwaukee Journal Sentinel reports. Jones (knee) was listed as a limited participant in Thursday's practice, Tom Silverstein of the Milwaukee Journal Sentinel reports. Packers head coach Mike McCarthy said that Jones (knee) would take part in team drills Thursday in what he labeled a "trial return" for the running back, Rob Demovsky of ESPN.com reports. Jones (knee) practiced in a limited capacity Wednesday, Rob Demovsky of ESPN.com reports. Jones (knee) was limited to rehab work Wednesday, but the Packers still hope to have him back at practice by the end of the week, Ryan Wood of the Green Bay Press-Gazette reports. Jones (knee) will start Week 13 prep in the rehab group with the potential for a return to practice Wednesday, Michael Cohen of the Milwaukee Journal Sentinel reports. Jones (knee) has a final pre-trial hearing scheduled for Feb. 1 on account of multiple charges stemming from an Oct. 1 traffic stop, Michael Cohen of the Milwaukee Journal Sentinel reports. Packers head coach Mike McCarthy confirmed Monday that Jones' left MCL sprain is considered a "multiple-week" injury, with the team subsequently ruling the running back out for Sunday's game against the Ravens, Wes Hodkiewicz of the Packers' official site reports. Jones is expected to miss 3-6 weeks with an MCL injury, Adam Schefter of ESPN reports. Jones may have sprained the MCL in his left knee during Sunday's 23-16 victory at Chicago, Ian Rapoport of NFL Network reports. Jones (knee) has been ruled out of Sunday's game in Chicago. Analysis: When a player is carted off the field, getting clearance to return is never guaranteed. With a limp in tow, Jones is set for testing on his left knee to determine the precise nature of the ailment. Expect Ty Montgomery to see an uptick in reps, but Jamaal Williams is a candidate to receive work out of the backfield as well. Analysis: After the Packers' initial drive, Jones' left leg was experiencing a significant limp, and he was eventually carted to the locker room, according to Michael Cohen of the Milwaukee Journal Sentinel. Jones' odds to return are up in the air, but in the meantime, Ty Montgomery and Jamaal Williams will combine to lead the backfield. Jones and Ty Montgomery will continue to work as part of a committee at running back, with the rookie handling most of the early down work while Montgomery earns most of the third-down snaps, Rob Demovsky of ESPN.com reports. Jones rushed five times for 12 yards in Monday night's 30-17 loss to the Lions. 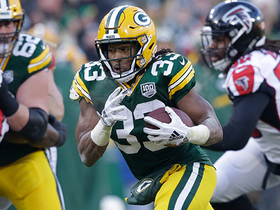 Watch Green Bay Packers running back Aaron Jones' best plays from his 2018 season. 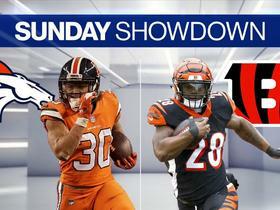 The "NFL Fantasy Live" crew discusses some of the key Sunday matchups and which players will stand out in each game. Green Bay Packers running back Aaron Jones trucks Minnesota Vikings defensive end Everson Griffen in the hole for third-down pickup. NFL Network's analysts discuss the best running backs for Week 12 in fantasy. 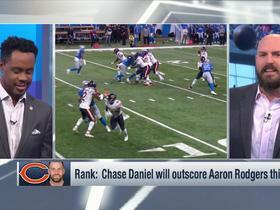 NFL Network's 'NFL Fantasy Live' crew explains which players you should consider trading for before your fantasy playoffs. 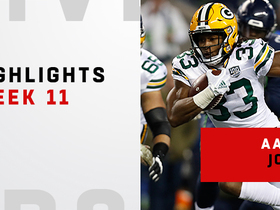 Watch every run and catch from Green Bay Packers Aaron Jones in his Week 11 matchup against the Seattle Seahawks.